Paia Truths and Rumors – August Edition! Once again, things are on the move in Paia. Hurricane Iselle spared Paia and most of Maui, but as I was taking pictures just a few days after the storm passed by, there were definitely a lot of sandbags and boarded up windows still to be found. 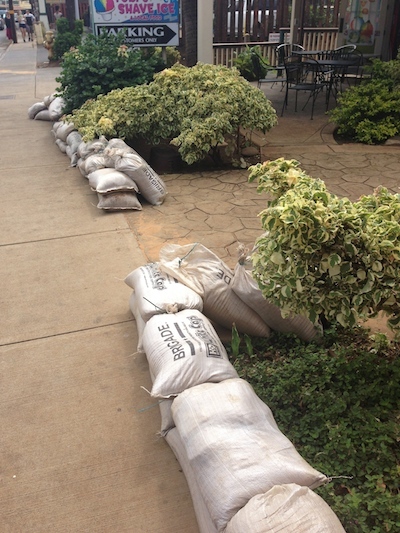 Baldwin Avenue has the habit of turning into Baldwin River during heavy rains, and the shopkeepers were taking no chances. On to the town gossip – Just today the Maui News shared that the owners of Mana Foods have confirmed that they are indeed opening a raw-food restaurant serving lunch and dinner called Maka Mana. Ono Gelato has changed its name to Paia Gelato, and the location has merged with its sister shop, Hana Bay Picnic Lunch company. According to the owners, Paia Gelato is still using the original gelato recipes, using fresh local fruits as well as high quality bases direct from Italy. locally made jams, jellies, coffee and sugar! The jewelry shop Oceania Maui – entered the shop very briefly known as Makai Gallery (and Paia Pharmacy before that) – and is now called Oceania Maui Gallery & Jewelry Paia. According to the paper sign on the door, the old location of oceania maui will be the new location for Pakaloha Bikinis some time this month. 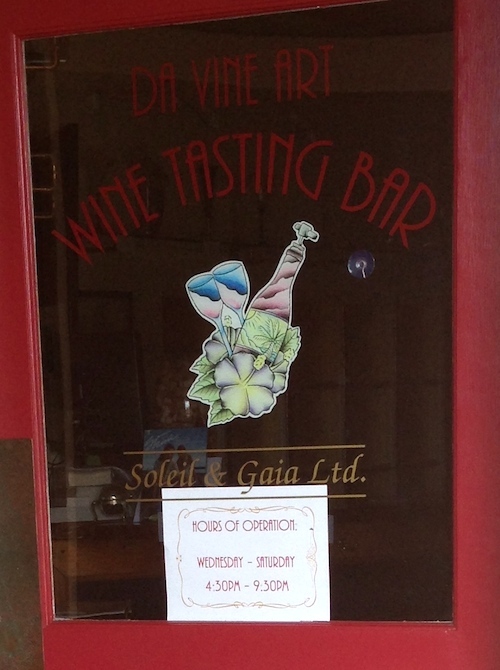 Another new (though long time in waiting) addition to Paia is the opening of the Da Vine Art wine tasting bar. Lots of construction going on – just next door to Milagros (anyone know what’s going in? ), at the old tiny shop lot, and the former Nellie’s site. A fun new trend in Paia is these chalkboard signs – and there appears to be some serious competition going on for the most artistic signs! Also, check out the upcoming sale at Pearl, and grab a brownie at nearby Dazoo to celebrate your great savings. Blogging Disclaimer: I am a paid representative for Dazoo, but the brownies are seriously good. and gluten-free!